This was a good, hard-fought Big 12 season by Texas but they couldn’t quite put it together for the league championship, yielding it to the Oklahoma Sooners who maintain their place atop the conference. It was an inspired performance by the Sooners, who managed a stronger defensive effort than they’d shown in some previous game, and who mostly protected the ball despite Texas regularly forcing Kyler Murray into uncomfortable situations. Texas finishes 9-4 with an upcoming trip to the Sugar Bowl, pending the SEC title game outcome and the committee’s decision making about whether to ignore the SEC title game outcome or not. Presumably an Alabama win secures the Sooners’ place while a Georgia victory (particularly a narrow one) makes things more interesting. But let’s talk about that disappointing outcome in Jerry World. My main contention before the game was that Texas needed to make this a contest that was settled between the hash marks. Oklahoma is too explosive on the perimeter and the chance for Texas to attack the young Sooner safeties, inconsistent front, and struggling slot defenders was huge. 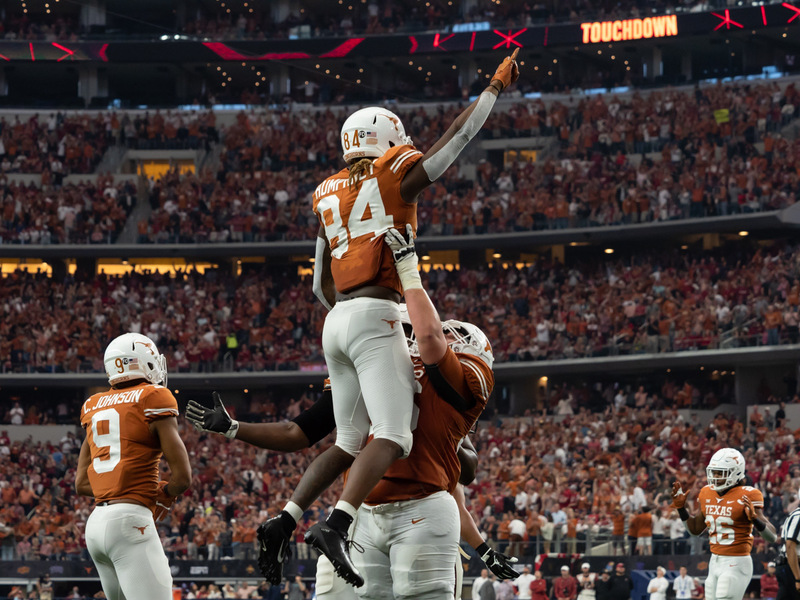 There was an opportunity there for the Longhorns to beat them up with the run game and tosses to Humphrey over the middle that lead both to consistent point scoring and long drives that kept Kyler Murray on the bench. They had Caleb Kelly as the Sam LB, much like Allen Kenney of Blatant Homerism predicted over at CrimsonandCreamMachine.com. But the real key was that they freed him up to play the run aggressively by sending freshman safeties Delarrin Turner-Yell and Brendan Radley-Hiles to the bench while playing three cornerbacks and using Tre Norwood up tight on Lil’Jordan Humphrey. Norwood played a great game, denying Humphrey the space and leverage he’s accustomed to working in the slot and resulting in a relatively quiet seven catch for 51-yard day with a TD. Additionally, the late INT by Ehlinger came trying to force the ball in against that coverage and Humphrey and Ehlinger had a different read on what the route adjustment should have been there. With Kelly up tight in the box Texas’ tight zone play that had gashed Oklahoma in round one, as well as much of the rest of the run game, was tough sledding. Tre Watson and Keaontay Ingram combined for 17 carries that produced only 46 yards, no touchdowns, and a fumble that went out of bounds but cost Texas a few yards. That gameplan begged for Texas to attack them by throwing the ball around, so that’s what they did, but that resulted in the Sooners getting the outcome they wanted from this game. A contest in which Texas and Oklahoma were both flinging the ball around and it was a contest of which team could be more efficient in that style of fight. This will likely be a common takeaway and I think it’s the right one. Oklahoma’s defensive staff had the same read on this game I did but unlike me, they were determined to work out a way to put their defense in a decent position to get stops and not be the achilles heel in pursuit of a Big 12 championship. Meanwhile, the Texas offensive staff clearly did not anticipate the defensive gameplan by the Sooners and spent the day cycling through various dropback passing game adjustments. In the first half they had a few plays where they stubbornly ran into loaded fronts, in the second half they tried to work the passing game more but just couldn’t do enough damage. There were chances in this game for the Longhorns to take over the game and the offense came up short. The first was the drive early in the second quarter after the defense forced a quick punt with Texas already sitting on a 14-6 lead. Had Texas gone up 21-6 by scoring a TD on this drive, this is a different ball game. Instead, after an initial first they ran into a loaded front for no gain, then Sam Ehlinger ended up with “carries” on the next two plays with that last one consisting of a play where Sooner DL Amani Bledsoe bulldozed Sam Cosmi and inflicted a sack. The second was after Gary Johnson’s hustle play on defense that forced what could have been the decisive turnover. Texas immediately came out and failed to pick up a boundary corner blitz that resulted in Sam Ehlinger taking a blindside hit and safety. In a game like this Texas had to have the edge with their line of scrimmage adjustments. Ehlinger’s ability to make checks at the line, find the mismatches, and then distribute the ball to Texas’ various ball-control weapons is what makes this offense tick. In a crucial moment, they failed to win the chess match at the line. Obviously they still made a game effort. They almost covered the spread with the late drive and Collin Johnson had a record-breaking day working against Parnell Motley with eight catches for 177 yards and a TD. Sam Ehlinger made a lot of plays with his legs and arm, hitting 391 total yards of offense on the day and scoring four TDs. He missed some others obviously, Texas couldn’t play the game like they wanted or score enough points to abuse the OU defense like they needed in order to get the win. They didn’t have enough answers in the booth to break the Sooner gameplan and break the game open. Kyler Murray had a pretty strong game but Texas did a great job dealing with his abilities and taking away weapons from the Sooners. They played nickel personnel in this game, trusting Shark McCulloch to help contain Murray in the pocket (which he did pretty well with just a few exceptions) and deferring stress to the Texas CBs as they’ve done in other big games in which they came out ahead. The Texas CBs and deep safeties barely held up under the strain. Kris Boyd incurred a good number of penalties scrambling to hold up isolated in space, Brandon Jones got picked on some, and a crucial early INT by Caden Sterns was taken away by a blatant facemask/hold by Kris Boyd trying to keep Marquise Brown under wraps. Trey Sermon and Kennedy Brooks combined for 28 carries for 93 yards at 3.3 ypc and a score. Kyler Murray ran around some with mixed results, 10 carries for 39 yards and a few first downs but also a few sacks and TFL when he couldn’t beat Texas contain. Ultimately though, Oklahoma made some adjustments and switched to playing with four wide receivers. Texas remained in nickel in those instances and made game efforts but obviously also gave up 379 passing yards at 11.1 ypa to Kyler Murray, along with a 3-0 TD/INT ratio. They did force some punts and field goals but they didn’t generate enough turnovers to flip the game. Oklahoma was able to win on offense by getting the ball on the perimeter, which is where they are most explosive and dangerous. I said before the game that I thought Texas was the tougher and more disciplined team. They are tougher and more physical, but Oklahoma brought the more focused and disciplined effort into this game, likely because they had a better gameplan that put them into position to play to their strengths. Texas had a number of special teams gaffes that added up in the big picture. There was a shanked punt, a punt into the end zone after taking a delay of game penalty to make that less likely, a missed/blocked extra point, a kick catch interference that gave OU the ball on the 20 instead of the 5, and an unneeded hold on a Lil’Jordan Humphrey kick return. Oklahoma’s insistence on doing the horns down after their decisive TD put their kick team in a bad spot and Humphrey almost made them pay in spectacular fashion, only for a Thompson hold to negate the score. They had a shot at attempting an onside kick down eight with well over a minute to play. Texas was penalized for 128 yards on the day and they weren’t bogus calls by the officials but multiple instances of Texas either losing their composure or compensating poorly for getting beat. The officials did miss a DPI call on Humphrey on a fourth quarter drive by Texas, but Humphrey and Johnson also dropped crucial passes. All that to say, leave the “officials blew this game” complaint in Arlington because that wasn’t decisive in this game. The failure to prevent the Oklahoma score before the half and then the huge swing after the safety loomed largest in this game. That was when they punted into the end zone and then played overly conservatively on defense even though that had cost them badly in the fourth quarter of the previous contest and consequently gave up a TD and the lead before the half. 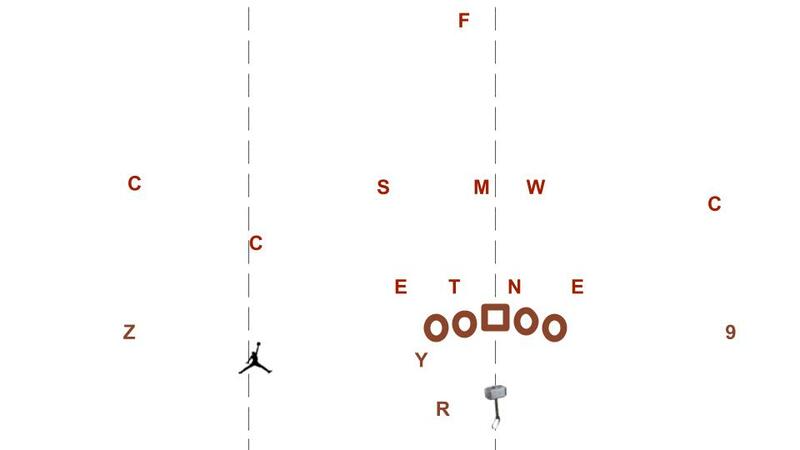 The safety was a major failure by the Texas offense to identify Tre Brown’s obvious inside lean and leverage, as well as another instance of Texas struggling to send in a play-call that could generate a good or quick read for Ehlinger because they were frustrated by Norwood’s coverage on Humphrey in the slot. Finally that was followed up by an all too typical Texas defensive series in which they made regular stops against the run only to blow coverages or get beat on third down in the passing game. The Sooners converted three third downs on that series, two of them coming when they targeted Foster playing in Sterns’ position and another coming when Texas blew an assignment on a mesh play over the middle. Thanks in part to that final drive, Oklahoma finished 8-14 on third down with a fourth down conversion while Texas was 8-13 and also with a third down conversion. With the game on the line in the crucial possessions, Oklahoma had the better plan and were more composed and on point. Interestingly, that showed up on first down for the offense and third down for the defense. The takeaway from Texas this season is that they are close but not there. A team with freshman kickers, freshman safeties, and then a sophomore QB still looked like it when the game was on the line. On the bright side, the normal trajectory for a team in rebuild is to lose big, lose close, win close, and then win big. This team regularly won close, often winning close when it seemed they should be winning big. The goal this coming offseason will be to finish the construction of this team into a unit that can regularly win big and then be in position to try and win close when facing elite competition.